Be dazzled by all New York has to offer when you book your stay with the spacious Fairfield Inn & Suites New York Manhattan/Downtown East. NEW YORK, NY--(Marketwired - Jul 21, 2015) - If everyone comes to New York looking for something, that something may just be a great deal. And at the Fairfield Inn & Suites New York Manhattan/Downtown East, travelers will find several this summer. With three fun-filled packages all on offer, the property makes visitors feel as savvy as the locals while they have the vacation of a lifetime. The package also includes a bike map, bike locks and two bottles of water for guests' urban expedition, with helmets available for rental. To book the package, which is available through September 12, 2015, travelers may use the promotional code YX1. With so many restaurants and attractions, New York can be as romantic as it is exciting. And for those eager to celebrate the Supreme Court's latest landmark ruling, the Pride & Joy Couples Package couldn't be timelier. Guests who take advantage of this offer enjoy late checkout and a bottle of chilled Champagne in their deluxe accommodations, where plush bedding, small appliances and upscale bath amenities make the property one of the most stylish, value-added hotels in Lower Manhattan. Available through September 30, 2015, the Pride & Joy Couples Package may be booked using the promotional code 4LG. Rates start from $199 per night. Of course, sometimes the best deal is just getting something for nothing. And for that, the hotel is offering a Bonus Points promotion. Available through September 7, 2015 using the promotional code M11 the offer awards 3,000 Marriott Rewards points to travelers who arrive on a Thursday or a Sunday night. No matter which hotel offer travelers book, everyone can indulge in the hotel's numerous perks, like free Wi-Fi and 24-hour access to both the business and fitness centers. And as one of the few New York hotels with free breakfast, this property ensures guests make the most of whatever they choose to do by dining well in the morning. Options like Belgian waffles made from scratch, sausage and Canadian bacon, fresh fruit, New York bagels, scrambled eggs and more not only refuel guests, but provide a delicious bite of the Big Apple. At the Fairfield Inn & Suites New York Manhattan/Downtown East, visitors encounter inspired, modern accommodations in the heart of the Lower East Side. 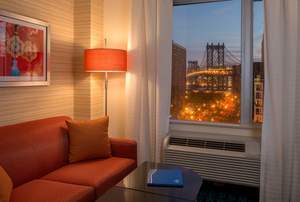 And while the hotel's location near New York City's legendary Chinatown and 9/11 Memorial encourage sightseeing, its thoughtful amenities and 24-hour service make it just as enticing to stay in. Guests can congregate in the stylish lobby to network, relax or catch up on work at the business center. Or they can make themselves at home in spacious guest rooms outfitted with microwaves, mini-refrigerators, coffeemakers and ergonomic workspaces. The fitness center, complimentary daily breakfast and free Wi-Fi throughout the property only add to the appeal of this vibrant destination.